The capital of Ecuador is, with around 2.6 million inhabitants, the second largest city in the country. The traffic is immense, as many people move daily to work, to buy or to sell and back home. Especially in south-north direction – in the morning – and in north-south direction – in the evening – the traffic is very high. Unfortunately, the filters of the vehicles are not always up to date and especially some of the buses emit clouds of black exhaust fumes that take your breath away. Fortunately, all over the entire urban area we can find a variety of parks, green areas and green squares that compensate the smog, at least locally a little. The green areas invite you to relax, but also offer many opportunities for being active. Sometimes concerts take place in a park. There are traveling hawkers everywhere, selling almost everything from drinks, snacks to key rings and household items. It is no surprise to buy a broom when visiting a park in Quito. Let’s start our tour to Quito’s green spaces. We begin at the main square in the old town. 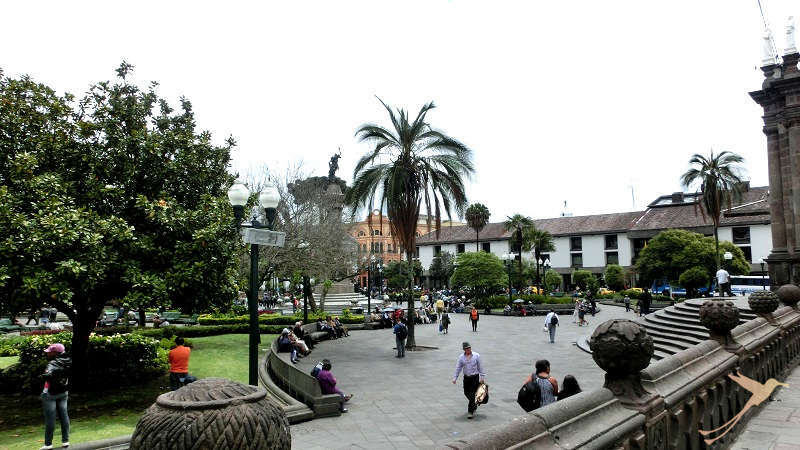 The often visited and photographed Plaza Grande, also Plaza de la Independencia, is encircled by government buildings, hotels, the cathedral and a few shops. During a stroll through the old town, you can rest on one of the many benches in the square and enjoy the greenery in the middle of the colonial buildings. The place has the typical star shape. Once it was a simple forecourt for the government building on which carriages drove and markets were held. It was only greened at the beginning of the 20th century and designed in the style of French gardens. Some of the palm trees in the square date from this period. From the Plaza Grande we continue north-east through the old town towards the San Blas district. Before, we briefly visit the newly created Plaza San Agustin in front of the Cafe Crustum 2850. On a bench under a small tree you can enjoy your coffee and observe what is going on in the surrounding small streets in the middle of the old town. 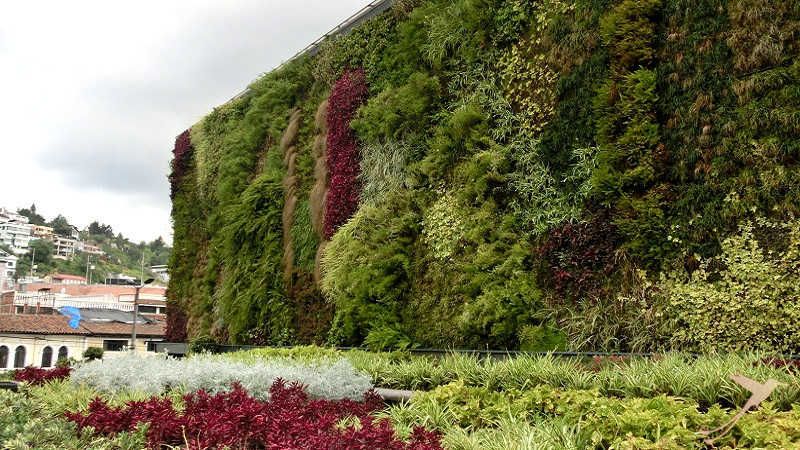 Close to the trolebus stop Hermano Miguel, we find a green wall, a sign that the ecological awareness of the city has grown considerably in recent years. It consists of different colored ground covers, ferns and grasses and looks like a mosaic. The area in front of the wall is also vegetated. We cross Avenida Pichincha and arrive at Plaza San Blas, the central point of the district. The front part of the place is mainly made of concrete and some small green islands but the rear part invites you to stay a while. You can rest on the benches in front of the flower beds and look at the beautiful church of San Blas. Some small trees provide shade. We follow one of the roads that lead to the east – and uphill – walk up the stairs and arrive to the Parque Itchimbia, quite out of breath. 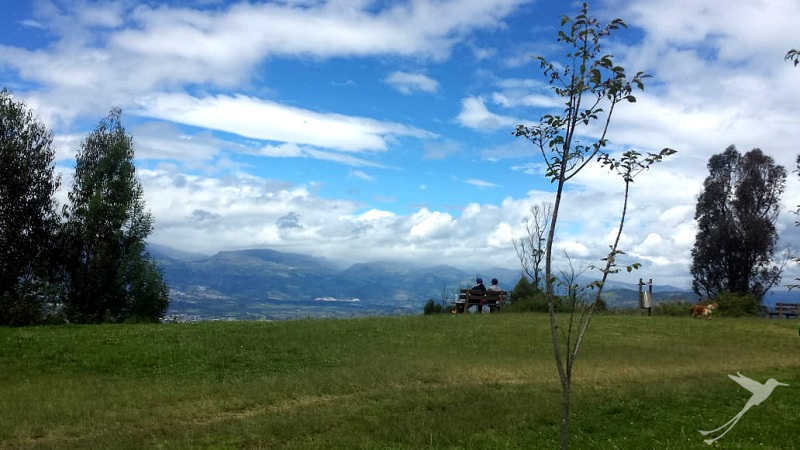 The large green area covers the whole top of the town hill and the effort of getting up here is rewarded with spectacular views over the city and the surrounding landscape. If the weather is clear you can see the volcanoes Guagua Pichincha and Rucu Pichincha in the distance in western direction. In the northeast you can see the Cayambe and in the southeast the summit of Antisana. In the Parque Itchimbia you can do cycling, inline skating, jogging, walking, etc. There are some small huts with tables and benches where you can barbecue and in the meadows whole families meet for a picnic and to play football. The peripheral areas of the park have an almost forest-like character with both paved paths and narrow hiking trails. There is also a football field and a playground. The central point of the park is the glass building, also known as the Crystal Palace, which can already be seen from the old town. 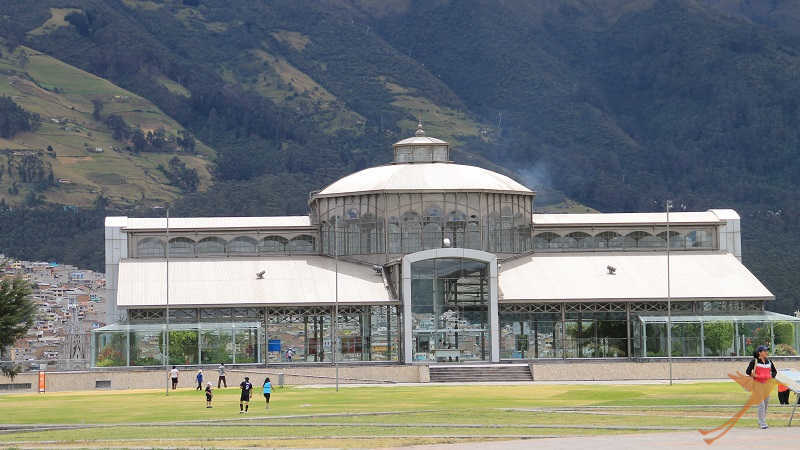 The metal structure was brought from Hamburg to Quito in 1889 and the building initially served as the market hall of the Santa Clara district. After restoration work, it was relocated to its current location in 2004 and is since then a cultural and event center. Under the building there are some service facilities as well as two restaurants. We leave the Parque Itchimbia and go back down to the city center. A bit north of the Plaza San Blas begins the Parque Alameda. The triangular green area is flanked by the two main arteries Avenida 10 de Agosto and Avenida Gran Colombia. 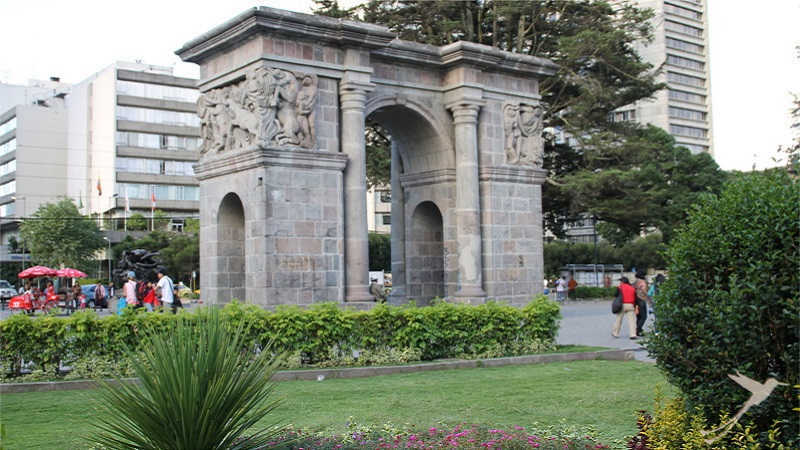 La Alameda is the oldest park in Quito. The southern part is rather unspectacular with lawns and trees. In the northern part was once the Botanical Garden of Quito. Today, some imported plant species from Europe and North America, which have grown together with native species, bear witness to this. There is a small pond with a canal that can be navigated by small boats. The most significant building of the park is the Astronomical Observatory from 1873. At that time it was one of the most important observatories in the world and is still in operation today. The equipment also includes a seismograph. The historical part of the observatory is open to the public and can be visited during a walk through the park. We follow the Avenida 10 de Agosto and reach after a few blocks the Parque El Ejido. A walk through the park is an experience for the senses. Its location near the old town and in the immediate vicinity of the nightlife and tourist district La Mariscal make it actually the colorful, green heart of Quito. In the past, horses and cows grazed here, later convicts were shot here. Today, the park is a popular recreational area for locals and visitors. On weekends, an arts and crafts market takes place on the main path. Here you can buy, among others, paintings and traditional handicrafts. There are also many stands where typical Ecuadorian food is sold. In various places of the park take place theater shows, artistry, clown shows etc. and one can watch old and young playing boules. Over 1400 endemic plant species can be found in the park. Southeast of Ejido, there is another small park with the Casa de la Cultura, which houses the Ethnographic Museum and a library. We move north along Avenida 10 de Agosto. 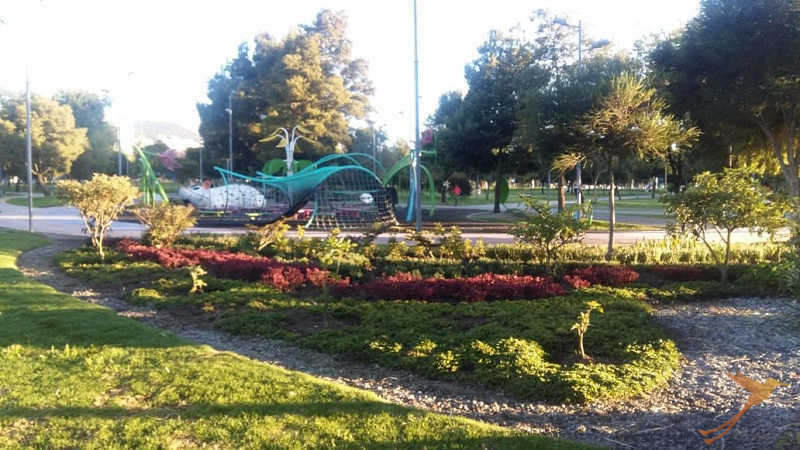 At the Trolebus stop Santa Clara we have a short rest on the right hand side in the Parque General Julio Andrade, a small green area on the edge of the district La Mariscal. Here you can hear birds singing from speakers. About 10 blocks north we turn right into Mariana de Jesus street and after two blocks we arrive at Parque EPMAPS, the water park. 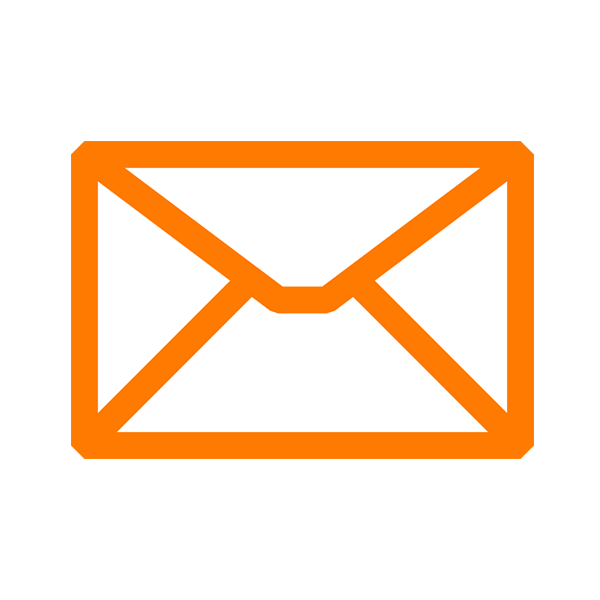 He is affiliated to the Public Water Company of Quito. It is a pretty small park, but it is very nicely decorated, with detailed flowerbeds, water fountains, small trees and seating. We follow the street Mariana de Jesus which comes across the shopping center Jardin. 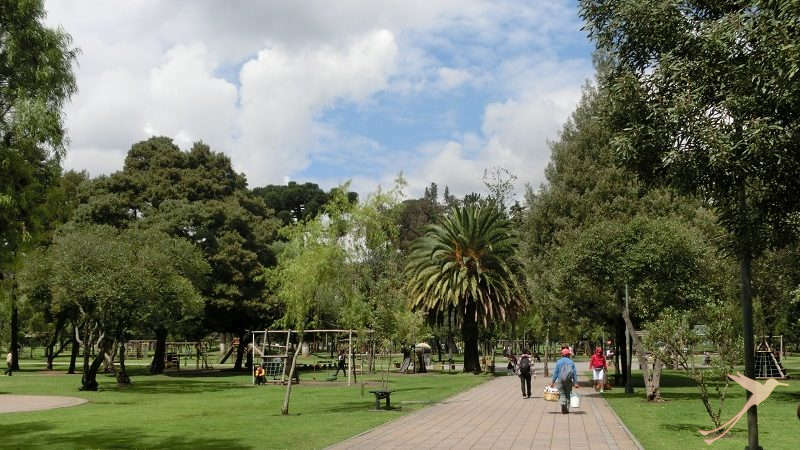 Directly behind it begins the Carolina Park, one of the most visited parks in Quito. Also this park has a varied history. According to Spanish chroniclers, the Inca Huayna Capac ordered to create two lagoons for hunting aquatic birds. These dried out later leaving behind a marshy landscape. At the beginning of the 20th century, the property came into the possession of María Augusta Barba de Larrea and became part of the Hacienda La Carolina. As agriculture was not possible, cows grazed in the marshy landscape. 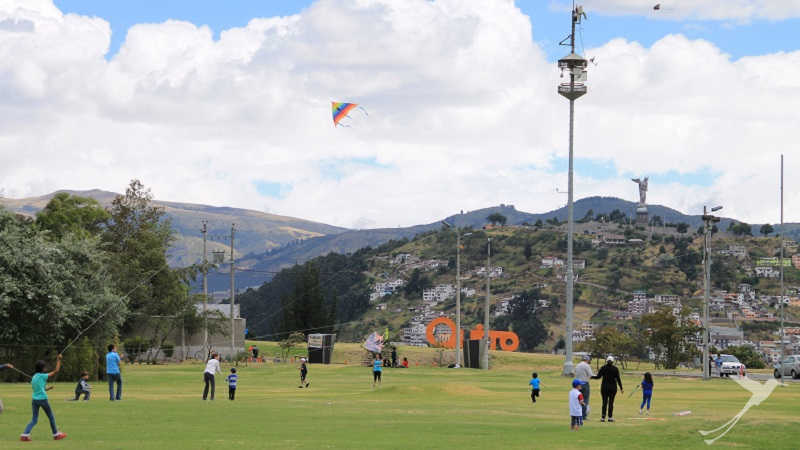 In 1939, the property was inherited to the city of Quito and a few years later there were first plans for the design for sporting use of the park. For financial reasons, however, initially only one racecourse and some sports fields could be realized. Only after the opening of the shopping center Iñaquito the park was redesigned and trees were planted. Nowadays you will find a hard-rubber racetrack, bike lanes, playgrounds, a facility for mountain bikers, ball courts, etc. Quite impressive is the outdoor gym with a variety of sports equipment, such as bars, horizontal bar and rings, where you can observe sometimes some amazing acrobatic performances. In the south of the park you find the Quito Botanical Garden with native and non-native species. Next to it there is a small artificial water landscape with canals and ponds, which can be navigated by pedal boats. Other interesting facilities of the park include the Natural Science Museum, a Vivarium and the ‘Airplane of the Fantasy ‘, which is now a stamp museum. 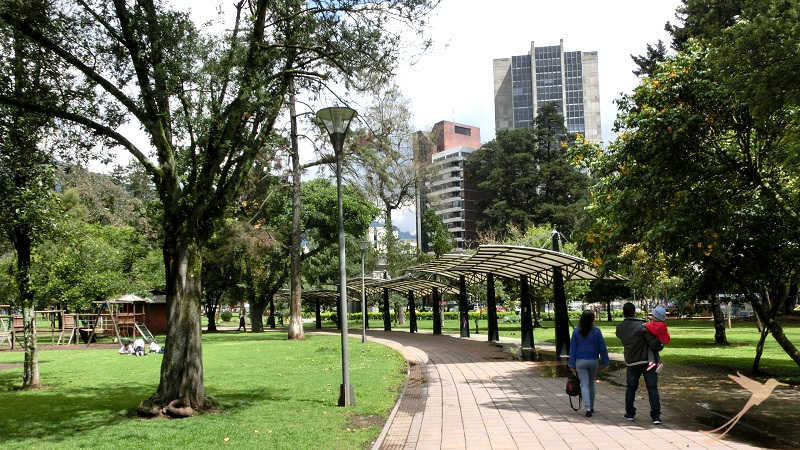 In our blog text https://soleq.travel/park-five-worlds/ you can find detailed information about the surrounding streets of the Parque Carolina. Further east, the Parque Metropolitano begins. It is hardly a park yet but with its 557 ha a particular landscape itself. On the weekends, the area is a popular destination for families who picnic or ride bicycle on the many trails. The park is home to 10 different species of hummingbirds and over 70 species of birds, some of them are threatened with extinction. The park is slightly higher than the rest of the city and is so a natural viewpoint over the city and the volcanoes in the background. 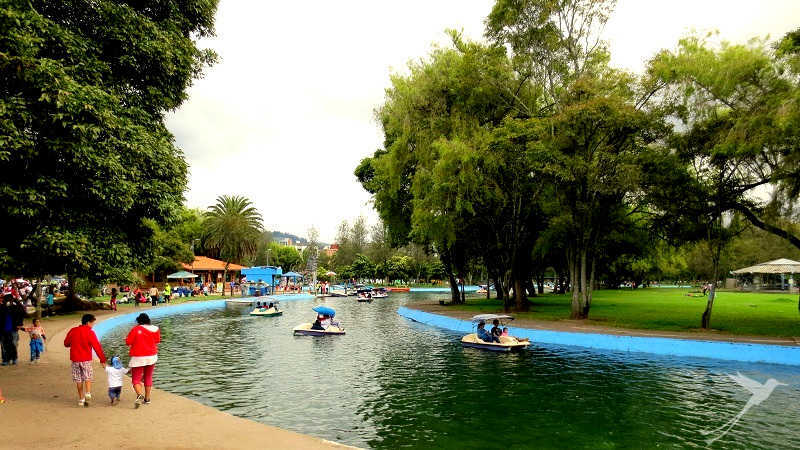 The last green area to visit is the Parque Bicentario in the north. More precisely, it is located in the area of ​the former airport of Quito. It was inaugurated in 2013 and is equipped with games and sports equipment. Due to its origins as an airport hangar, many cemented areas can still be found here, but these are to be dismantled until 2030. At the time of opening 2800 trees had been planted. Also this green area has ideal opportunities for cyclists and skaters and ball sports enthusiasts. Concerts take place regularly, for example, Metallica has performed here twice. We end our tour to the most important parks in Quito. Of course, we could not take into account all the parks in the city. Almost every neighborhood has an interesting green space or a small park or a nicely planted square – so there is still much to discover.